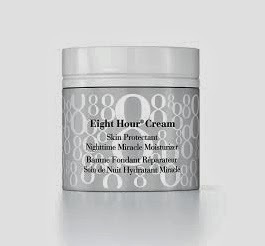 On counter now is the new offering from Elizabeth Arden, the Eight Hour Cream Skin Protectant Nighttime Miracle Moisturiser. When I think Elizabeth Arden, my thoughts automatically go to the famed Eight Hour range. I've had countless tubes of the original Skin Protectant and lately I've started to dabble in some of the other products of the range. I have the day moisturiser for when my skin is dry and I took the Lip Protectant stick with SPF away with me to Canada. I'm quite keen to try this new nighttime product which boasts lavender essence to calm and relax (and induce a peaceful sleep) in a hydrating gel-cream formula. Gel-creams are great for night because they absorb quickly and don't leave a residue on your pillow. Users report waking up refreshed with smooth and supple skin.